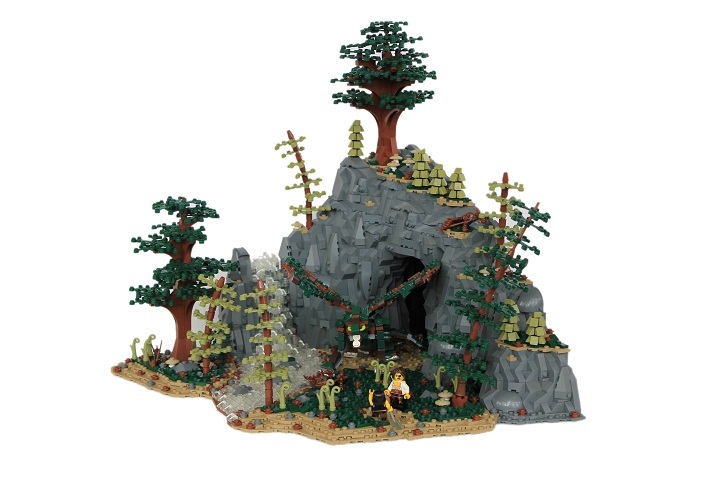 This is an entry into the Woodland Hideaway category of the Colossal Castle Contest, and the dragon is also an entry into the second Dragon Building Contest. The landscape design was inspired by Brother Steven’s Friosaelt Falls build. 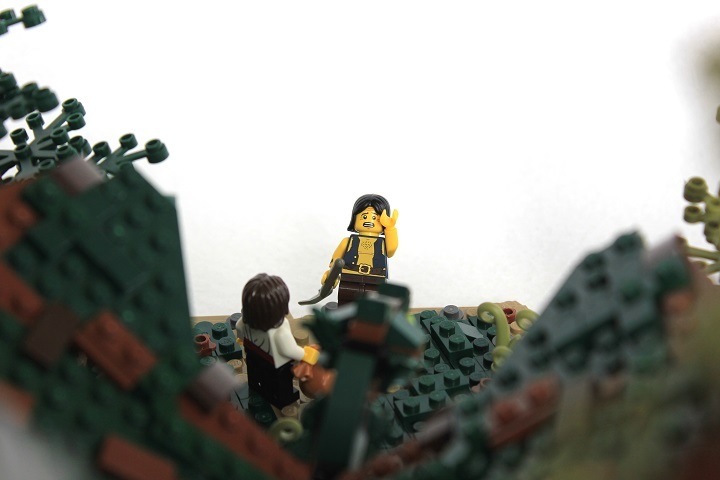 See more pictures on brickbuilt. Very nicely done, SK! Your rockwork is excellent, and the landscape does not disappoint, either. The dragon is surprisingly poseable, and I enjoy all of its articulation. 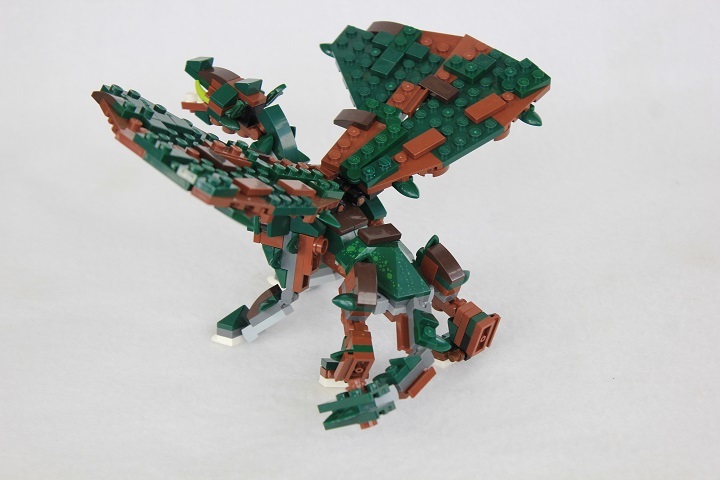 My main complaint with the dragon is that there is not much color unification; by that I mean that it looks camouflaged, with a bit of dark green here, some reddish brown there, and dark brown over there, rather than green with a brown underside, or something like that. It makes it hard to see where one part begins and another ends, and is a nightmare to look at amongst the greens and browns of your landscape because it blends in so well. 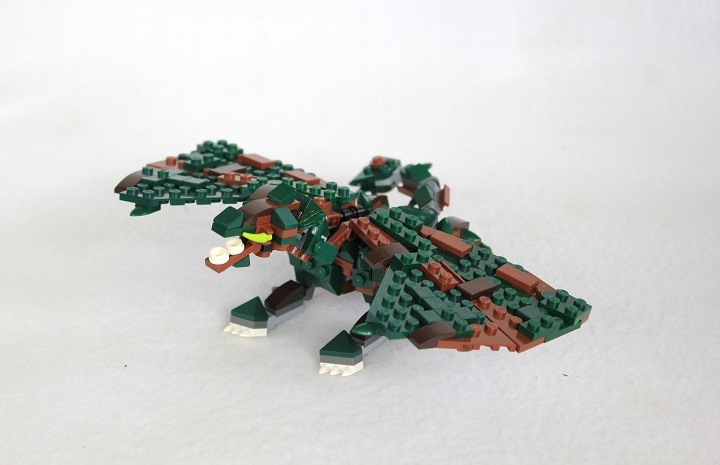 It is a very well done brick-built dragon, particularly on this scale, but I would prefer more organization with the colors. However, it is still a great build and a delight to behold. Good work! The rockwork and landscaping are nicely built, especially so much SNOT rock! Curving the trees is a nice touch, as is the foliage color variation between tree types. The dragon is very interesting! The points of articulation make for a realistic-looking reptile. I can see Henjin's argument on color unification, but I actually kind of prefer the camouflaged appearance (it seems realistic to have colors that blend with the surroundings rather than distinct color boundaries). 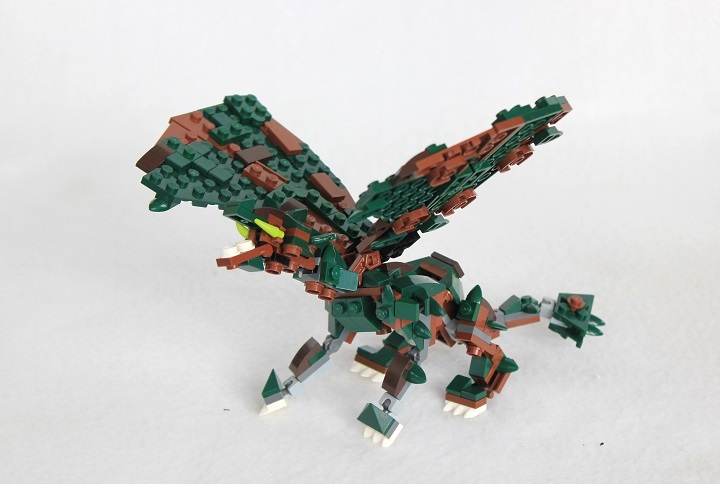 This camouflaging does make the dragon harder to pick out in the pictures due to the corners and angles on the bricks in the dragon and the background, but some camouflaging makes the scene more realistic. I would have been unhappy without images of the dragon alone (to be able to see the fine detail which blends into the background in the scene), but , of course, you included dragon images! 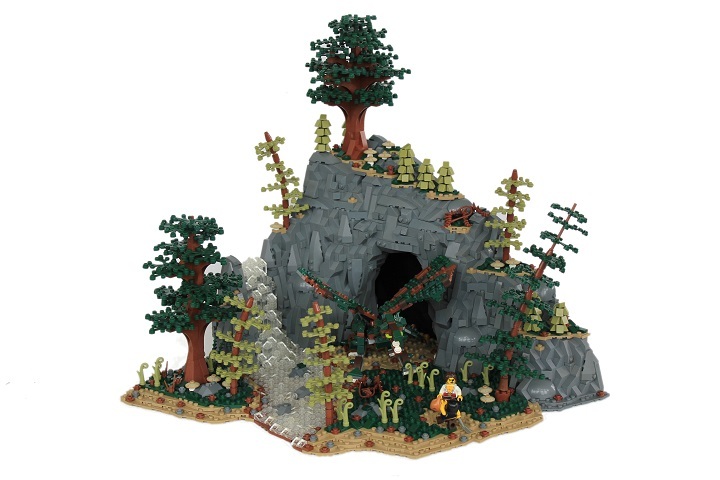 An open back side allows for more views while the black background in the main image gives the cave realistic depth! The landscape is superb. 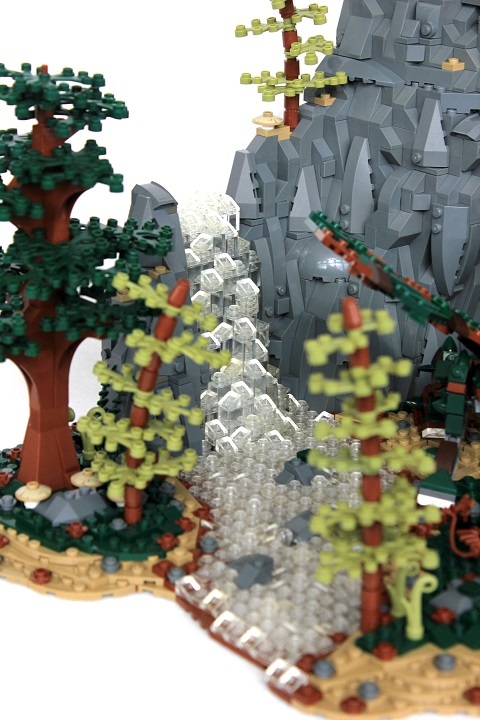 the rock work, the waterfall and the color scheme mesh well together. Regarding the dragon itself, it's strong point is the posing and functionality abilities. It's size and thinness takes away from an otherwise imposing beast. 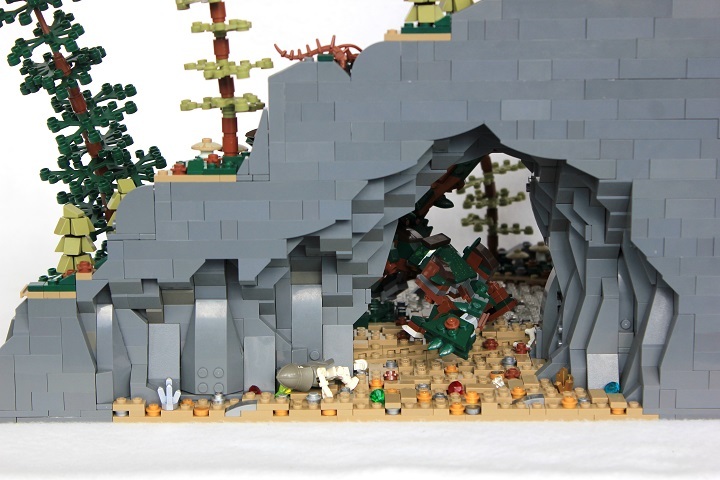 The cave that's littered with treasures and bones is a nice touch! Thanks Henjin! I forgot to include my description of the dragon earlier. "Skogrbani is a forest dwelling dragon that is both cunning and fierce. His natural camouflage allows him to ambush unwary prey, while his strength and armor make him a match for most foes." Thanks Slegengr! The black background for the main image was just some black bricks set up to fill the backside of the cave. I was pretty pleased with how that worked out. Thanks Blufiji, I wanted to include some of his treasure hoard embedded in the dirt of his cave and I'm glad you liked that detail. I've seen (and admired) this build on Flickr. Man, this is just so gorgeous! The landscaping is absolutely awesome, and that's without saying anything about the dragon! That rockwork is fabulous seems so natural shaped and the inclusion of a waterfall with the trees is wow. Thank you, Gunman. The rockwork is a bit different than most of what I've done before, but I was pretty pleased with it. Thanks Niku! And you're completely right about the dragon's eyes, with the head construction I used, I couldn't figure out how to get the eyes higher. I may have done more rockwork than snow actually, as a castle builder I tend to use it a lot. I really like this all the way around! I think the dragon's camouflage is awesome, and I love the foliage. I strive to make half-way decent foliage and tend to be disappointed myself. I think what you have is great. I love the way the trees bend, too. Is that the flex tubing for the trunk?